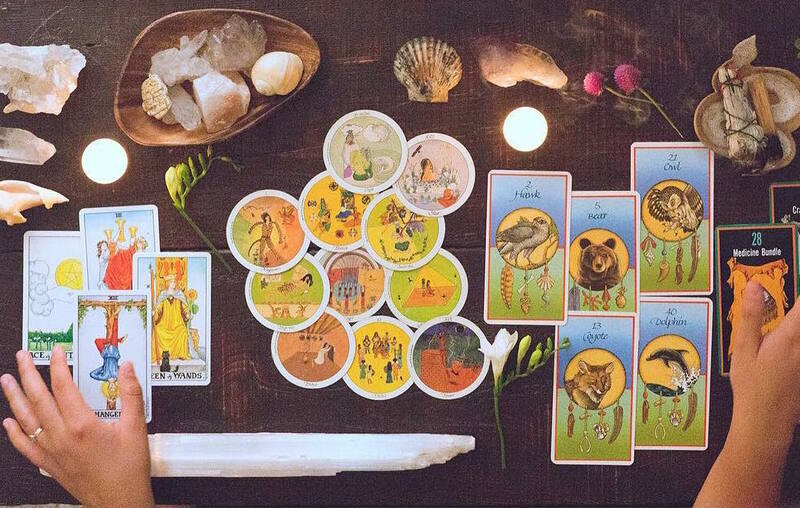 Tarot is everywhere right now, from the shelves of Urban Outfitters to everyone’s Instagram feeds, from your aunt’s altar to your BFF’s cupboard. Tarot is definitely having a moment and for good reason. Tarot, which is considered a form of divination or divining the future, may have the connotation of reading what’s to come, but it’s really much more than that. Tarot is a tool to find deep and meaningful connections to ourselves and others. And now, it’s more accessible than ever. If you’ve been wanting to start a tarot practice but don’t know where to begin, we’ve got you covered. Tarot reader Lindsay Mack, aka Wild Soul Healing, helps us shed some insight on what tarot is and isn’t, how to start your own practice, and what it means to read the cards intuitively. So what IS the tarot? "The Tarot as a whole truly encompasses the entire arc of what it means to be a spiritual being having a human experience on this planet. The Majors are the macrocosm, bringing us through deep cycles of transformation and evolution on The Fool's Journey. The Minors are the microcosm, helping us to move through and master our thoughts, feelings, beliefs, and experiences. And the Court Cards, for me, are powerfully complex advanced archetypical energies. It is a beautiful tool for deep clarity, healing, wisdom, and spiritual connection." But what about those myths, such as the one that you shouldn’t buy your own first deck? "It's really about being in the unique flow of the bond you have with your deck and practice, and empowering yourself to have the confidence to trust what's right for you. There is really no right or wrong way to do it." Once you have your deck, it’s time to tune into the cards. Lindsay suggests to play! Have fun with the deck, reading any and every book on the cards that peaks your interest. She stresses that you’re building a relationship with the cards, and the most important thing you could to do foster this is to show up consistently, allowing yourself to be a student.
" Line up all 40 Minor Cards (from Ace to 10 in all four suits) and deeply study them both horizontally and vertically. What do all the twos have in common? What do all the sevens have in common? What is the arc of the characters in each suit? Some deep visual analysis can be so enlightening. And practice! When you pull a Minor in a morning Tarot pull, you get the entire day to see how that Minor is showing up in your life. If you're willing to immerse yourself and really live in the Tarot, it will become easier to understand the Minors." Lindsay is an intuitive tarot reader, meaning each of her readings are different and deeply rooted in what she feels. Although some people can read tarot without any sort of study, Lindsay’s practice is based on a sound understanding of the cards that allows her intuition to take hold during a reading. Don’t knock the bad stuff. One of the strongest messages the tarot sends is that our personal biases, opinions, and judgments very often color how we see things. Even if at first we have a bitter taste in our mouth about a certain card, most of the time we’re just seeing it from the wrong perspective. For cards that may seem “negative” like The Devil, Death, Three of Swords, or The Tower, Lindsay urges us to look at nature.
" Is there anything in Nature that is not in alignment, even if we cannot see the grand vision?" Lindsay poses. "For every pest, there is a predator; for every drought, there will eventually be rainfall; for every dark night, there is a dawn. Everything in Nature happens for us, not to us — that is the only way to view a 'negative' card in the Tarot, to look for the medicine and the invitation into healing that it brings us. We have to be open and willing, just like in life. It is only when we (understandably!) freak out about the presence of a scary card that we lose the potential of receiving the goodness contained therein." She suggests taking a deep breath and asking what treasures the card holds, if you’re originally uncomfortable with pulling it. You can also pull another card to help shed light on how to see the difficult card more objectively. A tarot card a day keeps the doctor away. Pulling a single card each morning is another way to build a strong tarot practice. By seeing how this card shows up in your day-to-day life, and by taking the time to reflect on that, you’ll be able to see tarot in action. Starting a tarot journal to record your experiences with the cards is also helpful. For her daily practice, Lindsay takes time to drop in with her spirit guides and ask what she needs to know on that particular day. You can do the same, tapping in to your own intuition to see it manifest. So find a beautiful deck and get reading! And don’t forget to trust yourself — you deserve it.